Bladder cancer is a common cause of cancer death, and survival is strongly linked to the stage at which it is diagnosed. This article will consider the part primary care teams play in the management of patients with bladder cancer and changes in practice that may improve patients’ experience. These statistics refer to diagnoses of invasive bladder cancer and not to superficial transitional cell carcinomas, to which reference is made later in the article. There are 10,700 diagnoses of bladder cancer in the UK annually.1 Of these, 7,700 occur in men and 3,000 in women. More than half (54%) of these diagnoses are in patients over 75 years old. The UK has the lowest rates of bladder cancer in Europe and the incidence has been falling since the 1970s. 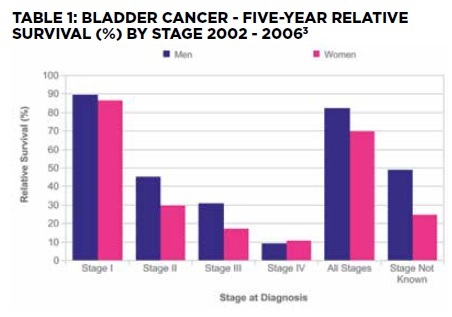 However, bladder cancer survival is poorer in the UK than the northern European average.2 Bladder cancer is the seventh commonest cause of cancer death in the UK and the sixth commonest cause of cancer death in men. Survival is linked to the stage at diagnosis (Table 1). Survival is roughly 10% lower for women compared to men. Generally, women have more advanced disease by the time of diagnosis and it is important to consider why to change practice and reduce this inequality. The diagnostic delay experienced by women was examined by the authors of one of the British Medical Journal’s ‘Easily Missed’ series.4 Women, prior to a bladder cancer diagnosis, had more urinalyses, urine cultures, diagnoses of urinary tract infection and more antibiotics – often empirically – than men. Follow-up to ascertain whether symptoms and haematuria ascribed to urinary infection have subsided may help to identify women with bladder cancer earlier and this advice is now incorporated in the new guidelines. Risk factors include age (most cases occur in people aged over 60 years of age), smoking and, rarely, occupational exposure to chemicals in the rubber and dyeing industries. Family history in a first degree relative is also a risk factor, but there is no evidence of a genetic component and such a link is likely due to passive smoking. Risks are also increased in those who have been treated with cyclophosphamide, those with bladder stones, long term indwelling catheters (particularly in neurological conditions such as spinal injury) and schistosomiasis in those from Africa and the Middle East. An important emerging risk factor is exposure to pelvic radiation, as more people undergo successful cancer treatment, the late effects of treatment can appear as new malignancies. Public awareness of many symptoms that could be suggestive of a possible underlying cancer is low,5 including symptoms of a potential bladder cancer. Campaigns to raise awareness continue and the ‘Be Clear on Cancer’ blood in pee campaign has been run again recently and may lead to more patients presenting with haematuria or urinary symptoms. The new guidelines6 are summarised in Table 2. They were designed to identify a greater proportion of patients with bladder cancer, reducing the threshold of risk warranting referral from 5% to 3%. However, the urological cancer guideline is unusual, in that the age thresholds have been raised from those in the old guidelines, reflecting the evidence that has emerged from research within primary care, which underpins the new guidance. Haematuria may be caused by malignancies anywhere in the renal tract including the prostate and also in the endometrium, but there are also many non-malignant causes including calculi and renal pathology which should be borne in mind. Visible haematuria in bladder cancer is commonly intermittent, so isolated episodes of unexplained visible haematuria must be taken seriously. Research from primary care has shown that visible haematuria (VH) is the symptom which is the strongest predictor for bladder cancer. The positive predictive value (PPV) – the percentage likelihood that a patient presenting to primary care with this symptom will have a particular cancer for visible haematuria in those over 60 is 2.6, and for those aged 40-59 it is 1.4. So although the majority of patients with VH will not have a urinary tract cancer, and the level of risk does not meet NICE’s suggested threshold of 3%, as the strongest predictor we have, visible haematuria does need to be taken seriously and be explained. Non-visible haematuria (NVH) has a much lower PPV for bladder or other renal tract cancer, especially when it is not associated with symptoms and this is reflected in the new guidelines. Trace haematuria on stick testing in asymptomatic individuals can be ignored. For patients under 60 years with or without symptoms and those over 60 without symptoms, a cause for non-visible haematuria should be sought, but the likelihood of an underlying cancer is low and cancer pathway referral would be inappropriate. Urinalysis is the appropriate way to test for NVH, but requires a cautionary note; reagent strips degrade once a container is opened, especially on exposure to atmospheric moisture. Containers should be closed between tests and discarded according to the manufacturer’s datasheet – often four weeks after initial opening – to avoid false positive results. It is important not to attribute haematuria of any kind to anticoagulant or anti-platelet medication. Haematuria (VH and NVH) can be associated with urinary tract infection, but if either fails to resolve after treatment further investigation should be considered, either routinely or via urgent two week pathway, if age and other criteria are fulfilled. Recurrent or persistent urinary tract infection can be a presenting feature of bladder cancer and this is probably why bladder cancer is more easily missed in women. A woman may be treated empirically in a number of settings including out of hours and walk-in centres and her GP may not easily be aware of this. Many menopausal women have ‘cystitis’ symptoms and are appropriately treated with oestrogen creams, but in light of the new guidance there is a case for considering further assessment, at least with simple tests in primary care. Secondary care and bladder cancer To be diagnosed with cancer, pathological invasion is a prerequisite and is distinct from non-invasive disease, which is described as transitional cell carcinoma. 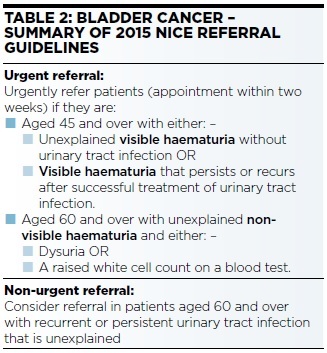 Non-invasive tumours are not included in epidemiological data for bladder cancer or the guideline on urgent referral for suspected cancer, and are not included in the two-week wait statistics. Their prognosis varies from very low risk to those who require major treatment, including intravesical therapy or cystectomy to reduce the risk of both progression to invasive disease and death. Assessment of prognosis to guide treatment needs to consider histological information, the size and number of tumours and the history of recurrence. Although invasive bladder cancer is the sixth most common form of cancer with over 10,000 cases annually, when non-invasive cases are added the number rises to over 18,000. Recent figures suggest a stable incidence and falling mortality in men. Narrow band Imaging (NBI) and Photodynamic diagnosis (PDD) are developments in cystoscopy technique. NBI uses a narrow band of light wavelength to enhance visualisation of tumour within the bladder and is easy to use at diagnostic flexible cystoscopy. PDD uses the instillation of a photosensitive marker into the bladder prior to cystoscopy, followed by cystoscopy using a blue light source. Tumour cells that have accumulated the marker are identifiable at cystoscopy and can be resected. PDD is only really practical as an adjunct to cystoscopy with possible resection of bladder tumour under general anaesthesia, has a better evidence base than NBI, but is more costly due to the use of a photosensitiser. PDD detects more carcinoma-insitu and multi focal tumours compared to WLC, resulting in a significant reduction in recurrence. It is uncertain if this benefit persists when a single dose of intravesical chemotherapy is given after transurethral resection, which is routine practice in most UK urology units. Many urology units have the technology to offer PDD and the recent publication of an enhanced tariff will help to make this routine care. Tumour markers, such as NMP22 (Nuclear Matrix Protein no. 22) and urinary cytology, are also available. NMP22 is a protein normally present in urine in small amounts, but at higher levels in those with bladder tumours, reflecting increased mitotic activity in the urothelium. They are included in the NICE Bladder Cancer guideline as an adjunct to cystoscopy and may guide the diagnostic approach taken. For example, because they have high specificity when positive, patients with positive tumour marker or cytology results would be advised to have cystoscopy under general anaesthetic to allow resection of tumour. Negative tests do not exclude bladder cancer, so have clear limitations. In future, referral pathways from primary care could be developed using tumour markers to guide the route of assessment, but it would be critical for GPs to understand the limitations of these markers. The key message is that a positive marker or cytology makes bladder cancer more likely but a negative marker cannot exclude it. Once a diagnosis of bladder cancer is made histologically, the grade and stage are the key prognostic factors. Some rare histological subtypes carry a worse prognosis, including the nested variant, in which the disease behaves aggressively, despite a deceptively benign looking urothelium, and micropapillary disease. Squamous and adenocarcinomas tend to present at a late stage. CT or MRI scanning will be used as part of staging for those with bladder cancer or high risk non-muscle invasive tumours to guide radical treatment choices. For transitional cell carcinoma there are three broad categories which determine treatment. Those assessed as low or intermediate risk with non muscle invasive disease will be followed up with check cystoscopy, perhaps with additional intravesical chemotherapy. High risk non muscle invasive disease is usually treated with BCG vaccine (but there is a worldwide shortage) or cystectomy in a minority of patients. The mechanism of action of intra-vesical BCG is not understood, but is thought to act as an immune-therapy. Muscle invasive disease, if potentially curable, is treated with either radical radiotherapy or cystectomy usually with neoadjuvant chemotherapy. Aggressive treatment of bladder cancer in the elderly may be difficult to implement due to frailty or comorbidity and a significant proportion of patients are unsuitable for potentially curative treatment. The worldwide shortage of BCG has led urologists to seek other solutions. These have included reduced dose BCG, unlicensed BCG and device assisted therapies. Device assisted therapies share a common goal, which is to drive the intravesical chemotherapy from the bladder lumen into the bladder tissue. This results in higher drug concentration deeper in the bladder wall either by disrupting the urothelium with heat or by driving charged drugs along an electrical current (inontophoresis). Several techniques are available including Electromotive Drug Administration (EMDA) using iontophoresis to increase drug uptake in the bladder wall, microwave assisted (Synergo) or heated (Hivec) intravesical chemotherapy, with temperatures of 41 to 44 degrees C, often in combination with small BCG doses. Effective communication with patients and their family is crucial to good palliative care. Ensure that patients are involved in management of their symptoms, and consider an advance care plan for patients as they approach end of life. Each care plan should be tailored to the individual and ensure that those around them are involved through clear communication. Advanced bladder cancer may be associated with similar symptoms to other disseminated cancers that require the same palliative care approach, but the symptoms from locally advanced local disease, which can be so hard to treat, need special mention. Patients with advanced bladder cancer commonly have troublesome urinary symptoms, which probably accounts for 46% dying in hospital. Intractable haematuria may occur, sometimes leading to urinary retention, blocked catheters and renal impairment. Simple measures – stopping anti-platelet or anticoagulant therapies, trying tranexamic acid – may help, but it is sometimes impossible to manage these problems outside of a urology unit. Radiotherapy (if radical radiotherapy has not previously been given) or embolization may be appropriate. Ureteric obstruction leading to renal failure is a frequent cause of death. Nephrostomy may relieve renal failure and in so doing will change the mode of death. It rarely extends life by more than a few weeks so patients must be properly informed in order to consent to a decision about nephrostomy. Discussions about such treatments would be a useful element of anticipatory care planning before the onset of renal impairment. Bladder symptoms such as dysuria, frequency and nocturia are common in advanced disease and may be improved by palliative radiotherapy, though there is commonly less benefit than when it is used for haematuria. Pain needs careful assessment, as it may occur as a consequence of local invasion of the tumour itself, or other impacts of the presence of tumour Pelvic pain caused by local invasion may be improved by hypo-fractionated pelvic radiotherapy (radiotherapy delivered at higher doses but in a small number of treatments) and would be appropriate if the patient has not had previous radiotherapy. A nerve block or chemotherapy should also be considered. Loin pain may be caused by ureteric obstruction and, if suspected, would require urological assessment if the patient is sufficiently fit and wishes to seek intervention. If the local hospital does not offer such assessment, ensure that the urology MDT can identify where this can be offered. Consider involving the specialist palliative care team for advice, support and management if symptoms are difficult to manage in primary care. GPs have an important role in seeking earlier diagnoses of bladder cancer, particularly in women, and in supporting patients with advanced disease. A good knowledge of the new referral guidelines and knowledge of local services – both in urology and palliative care – should help GPs achieve these goals.